A Settlor who has the trust created. A Trustee who manages the trust. One or more Beneficiaries who receive the benefits of the trust. You will also hear a Settlor also referred to as a Grantor or Trustor. A trust can also have multiple Settlors and/or Trustees. Then next question we answer is about revocable vs. irrevocable trusts, and how they compare. A revocable trust, commonly a revocable living trust, is an estate planning tool that a settlor can change at any time. So, if your needs change you can make amendments freely without the interaction of a third-party. 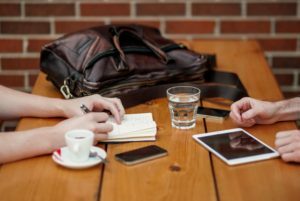 So, why doesn’t everybody set up a trust that is revocable as opposed to an irrevocable trust? There are several reasons. 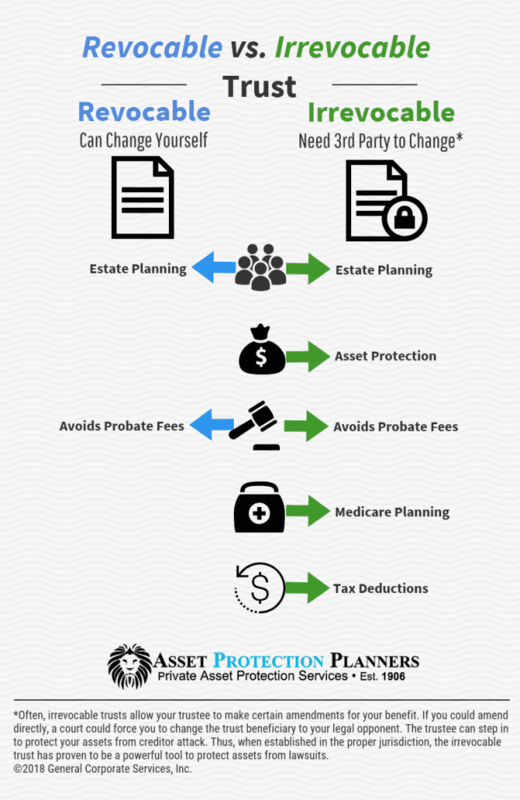 A revocable living trust is part of your own estate for asset protection purposes. As such, it offers no asset protection from creditors or those who seek to sue you. It also offers no segregation of assets in order to qualify for government benefits such as Medicaid or disability assistance. Plus, upon your death, assets in the trust are also yours for state and federal estate tax purposes. The primary reason people use irrevocable trusts to protect assets from lawsuits. Legal theory commonly allows a creditor to step into the shoes of the debtor. Thus, it allows the creditor do what he or she could do. For example, let’s say the settlor of a trust could freely change the beneficiary. The one who sued the settlor could step into his or her shoes and change the beneficiary to himself. If the trust allowed the settlor to independently spend trust assets on himself, the creditor could do the same. Plus, some people use irrevocable trusts to make sure that others carry out their wishes when they are no longer around. This is common in second marriages where a spouse wants to make sure that children from the first marriage get at least some of the assets. This article will primarily focus on the use of an irrevocable trust to protect assets from lawsuits, judgments and creditors. It will also touch on its role as an estate planning tool. Okay, so, what does irrevocable mean? In relation to a legal documents, irrevocable means a contractual agreement that one cannot readily alter, withdraw or terminate. The irrevocability of the commitment lets each party to the agreement proceed under the assumptions stated in the document. Can I Ever Change It? It’s not that you can’t change it, as there are often ways to make changes. It depends on the terms of the trust. But if the purpose is asset protection, the changes often require the approval of a third-party, such as the trustee. Most trusts that protect assets are discretionary trusts. For example, if you decide to cut out a beneficiary or add a new one, simply ask the trustee. The trustee, at his, her or it’s (in the case of a corporate trustee) discretion can do so. Therefore, you do not need to make irrevocable decisions. You just need to communicate your wishes to the trustee. The trustee has discretion to decide whether or not the act would be in the best interest of the beneficiaries of the trust. They will see if it complies with the settlor’s intent, the overall purpose of the trust, and if doing so would or would not put trust assets in harm’s way. With most irrevocable trusts, the Settlor(s) or Beneficiary(ies) may request that the Trustee make certain changes. The trustee can generally do so if it does not put trust assets at risk. To say it another way, if you could change it directly, the judge could force you to change the beneficiary to your legal enemies. So, by making it irrevocable, you are more likely to get what you want: the use of the trust property. By requiring third-party intervention, it ties the judge’s hands from directly forcing you to make the changes against your will. Don’t like the trustee? That’s okay. Simply fire him or her and hire another. You can change the trustee to anyone but yourself, a family member up or down the family trustee, an agent of yours, or a controlled employee. This is because courts consider these people your alter ego. There are many types of irrevocable trust. Not all are for asset protection. There are trust to hold life insurance, for charitable purposes, to reduce the tax bite, and to care for those with special needs. Many people ask us about fraudulent conveyance / transfer and if they can get into trouble for moving assets into such a structure. The answer is, that fraudulent transfer is merely a civil matter, not a criminal one. It is not a crime. You cannot go to jail for it. There are not fines. The most that can happen is a judge can put assets back to where they were in the first place. Properly drafted trusts allow for wide range of future possibilities. For example, there are circumstances that would warrant a change of beneficiaries or trustees. Perhaps Mom and Dad unexpectedly have another child. One child exhibits evidence of long-term substance abuse. On child tragically perishes. The trustee retires. A well-drafted trust addresses all of these circumstances. How Can It Be Irrevocable? How can it be irrevocable if I really can change it? Notice the operative word, “I.” Irrevocable doesn’t necessarily mean nobody on the planet can change it. It doesn’t mean that you cannot suggest a change to someone else. It just means that certain people cannot, independently, without outside cooperation, change it. This is a good thing. Remember, if you could just change the beneficiary at a whim, the judge could force your whim to be your enemy at law. We all like control. But if you have complete power to change the trust, it could be used against you in a courtroom. That’s because a judge could force you to use that control and that would likely not be a good thing for you. He can force you to change the beneficiary to the person who sued you. That will allow your opponent to take all of the money held therein that is needed to satisfy their judgment. So, when you are lose a lawsuit, a revocable trust puts the judge, not you, in charge. So, to have real control, set up an irrevocable trust, with an independent trustee. Then you put yourself in control instead of the guy who is suing you. You can get more information on how they work, how they are used and what they do here. The reader will also find helpful tips on understanding domestic and offshore trusts. You can learn how people use them in estate planning. Finally, one can gain comfort on how to have faith that your trustee will act in your best interest. What is a trust fund? A trust fund consists of the assets inside of the trust intended to provide for the beneficiaries. When creating a trust, transferred assets such as real estate, bank accounts created and funded in its name are now its property. 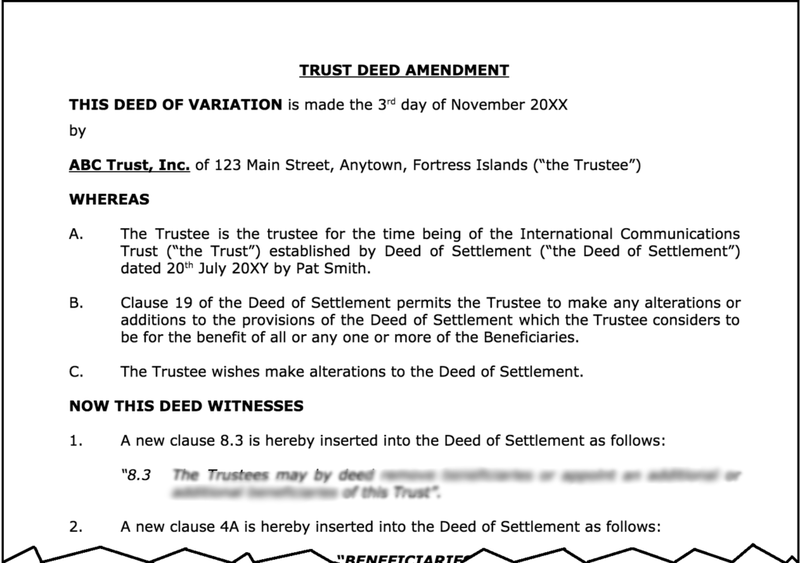 The trustee uses these and other assets placed and held inside for the intended purpose stated in the trust. Trusts such as this can provide for heirs for the long term. So, a trust fund simply consists of the assets that are placed inside of this type of legal tool. One example is a testamentary trust, which is under a will and becomes an irrevocable trust fund upon the death of the one who wrote the will. Some irrevocable trusts are for charitable purposes. A charitable remainder trust can offer substantial tax benefits. Putting money into such a trust can offer a full tax deduction for the year in which the funds were placed into the trust. Upon death the trust has some type of charitable purpose. An irrevocable life insurance trust (ILIT) holds and controls a term or permanent life insurance policy. Then it distributes the proceeds of when the insured dies. Upon death, the ILIT is not part of the insured’s estate. Therefore one can increase the amount one receives without paying estate taxes. In addition the life insurance trust can pay taxes, debts and expenses of the decedent. It can also protect receipt of government benefits such as Social security or Medicaid. This is because the assets of the trust are separate from that of the beneficiary. In the same vein, it can protect insurance proceeds from lawsuits against the trust beneficiary. The irrevocable life insurance trust can also help avoid the generation skipping tax (GST). Thus, it can give proceeds to grandchildren and others and avoid the 40% tax on distribution those more than one generation removed; plus to unrelated people of more than 37.5 years younger than the donor. A trust can be used to protect assets, but every trust is not equal to the next trust agreement, not by a long shot. A properly drafted irrevocable trust can protect assets from creditors. It can shield you from unnamed family members seeking addition as beneficiaries at the grantor’s death, or anyone else trying to take the grantor’s assets.